Excerpt from Baldt Anchor & Chain; included here as evidence the Chatham may have carried cast malleable chains for use with its stream anchor.� HMS Chatham was only 80 feet long, but nearly 140 tons which is to say she was damn heavy.� The use of chain presents itself as appropriate for a ship this weight. [From the time of Caesar until the the 13th Century we find little or no mention of the use of anchor chains. Between 1200 and 1700 A.D. we read that iron cables are sometimes used. The statutes of Genoa of 1444 make brief mention of “iron anchor chains.” An engraving of 1512 shows a ship with hawse holes and anchor chains clearly depicted. In the ensuring half century a few far sighted ship owners and ship captains had sufficient faith to experiment with iron chain, for in 1771 the French explorer Brouganville complained that he had lost six anchors in nine days and narrowly escaped shipwreck, which would not have happened had his ship been fitted with iron chains. In 1778, General George Washington conceived the idea of a buoyed barrier chain across the Hudson River, at West Point, N.Y. as a means of impeding the invading British fleet. In six weeks seventeen American blacksmiths forged a 1700 ft. long chain of 3-1/2 inch square stock weighing 275 pounds per link. This chain is still preserved at the US Military Academy, West Point. N.Y. This is a photo of the crew, literally taken the day before the accident. No one in this photo survived. 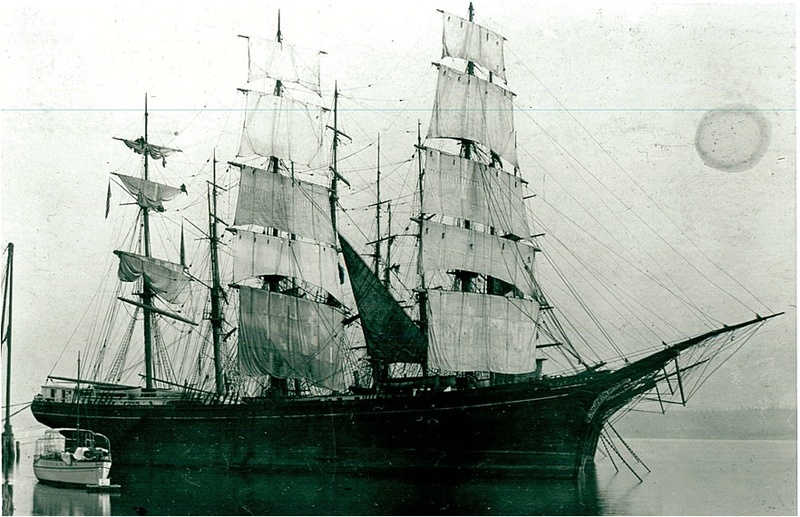 A four-masted steel barque built in 1889 by Richard Williamson & Son, Workington. Rigged with royal sails over single topgallant and double topsails. The lower and topmasts were made in one piece. 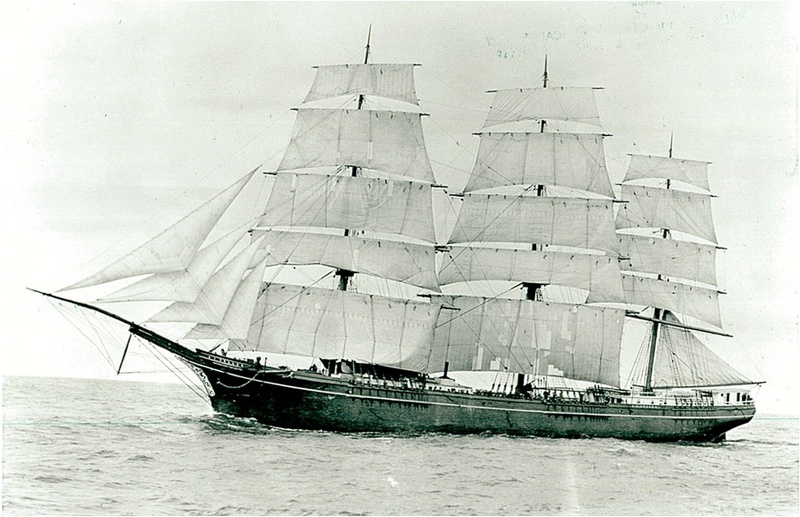 Belonged to the group of six four-masted barques called the Workington Sisters consisting of Eusemere (1890), Pendragon Castle (1891), Vortigern (1891) Caradoc (1892) and Conishead (1892). Launched at the shipyard of Richard Williamson & Son, Workington, for the Andelana Ship Co. (E.F. & W. Roberts), Liverpool. Assigned the Official British Reg. Captain J. Gillis was given command of the ship. Sailed on her maiden journey from Barry to Table Bay in 51 days with a cargo of coal. Sailed from Table Bay to Calcutta in 54 days in ballast. Sailed from Calcutta to New York in 112 days with a cargo of jute. Sailed from New York to Shanghai in 144 days with a cargo of case oil. Sailed from Shanghai to San Francisco in 32 days in ballast. Sailed from Hong Kong to San Francisco in 31 days. Sailed from San Francisco to Queenstown in 107 days with a cargo of grain for Hull. In command of Captain J. Richards. Sailed from Hull to New York in 42 days in ballast. 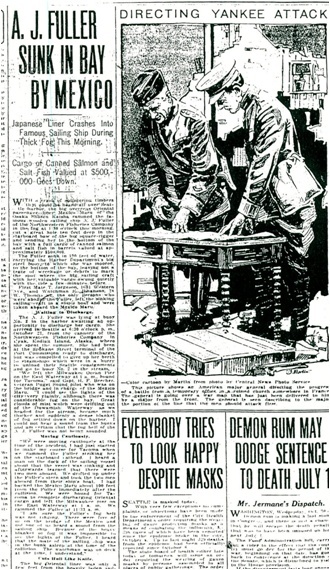 Sailed from New York to Shanghai in 111 days with a cargo of case oil. Sailed from Shanghai to Kuchinotzi in ballast. Sailed from Kuchinotzi to San Francisco with a cargo of coal. Sailed from San Francisco to Liverpool in 93 days with a general cargo. Was off Brow Head 88 days out but had to put into Holyhead to wait for a sufficient tide to get to Liverpool. Sailed from Liverpool to New York in 24 days in ballast. Sailed from New York to Hong Kong in 140 days with a cargo of case oil. Sailed from Hong Kong to Iloilo in 9 days in ballast. Sailed from Iloilo with a cargo of sugar for Delaware but had to touch at St Helena 120 days out for water and provisions. Arrived at Delaware 44 days later. Sailed from Delaware to Halifax in 9 days. Sailed from Halifax to New York in 11 days in ballast. 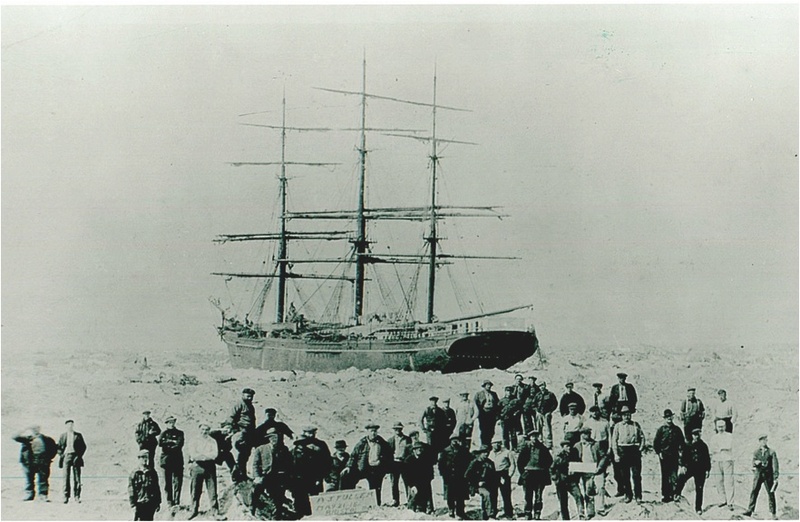 In command of Captain George W. Stailing late of the same owner’s ship Andrina which had been damaged in a collision with a steam ship. Sailed from New York to Yokohama in 130 days with a cargo of case oil. Sailed from Hiogo to New York in 185 days. Sailed from New York to Yokohama in 119 days with a cargo of case oil. Sailed from Yokohama to San Francisco in 23 days in ballast. Sailed from San Francisco to Sydney in 45 days in ballast. 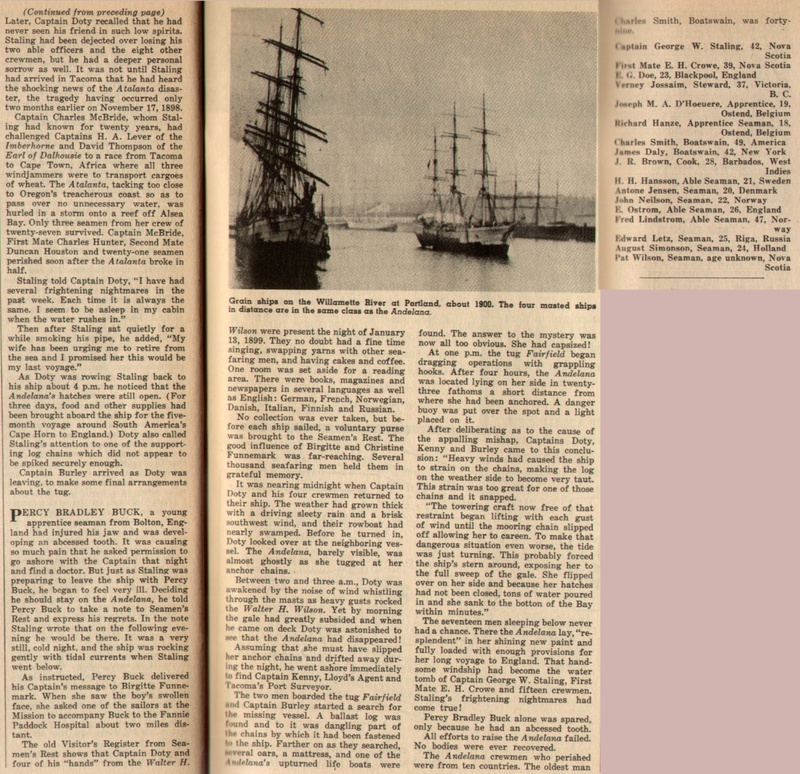 Sailed from Sydney to San Francisco in 63 days with a cargo of coal. Sailed from San Francisco to Queenstown in 116 days with a cargo of grain for Antwerp. Sailed from Antwerp for New York with a cargo of cement. Received storm damage to the rigging and had to put into Queenstown 30 days out. Subsequently sailed to Liverpool for repairs. Sailed from Liverpool to New York in 24 days. Sailed from New York to Shanghai in 133 days with a cargo of case oil. Was dismasted in a typhoon and had to be repaired at Shanghai. Sailed from Shanghai to Port Angeles, WA, in 47 days in ballast. 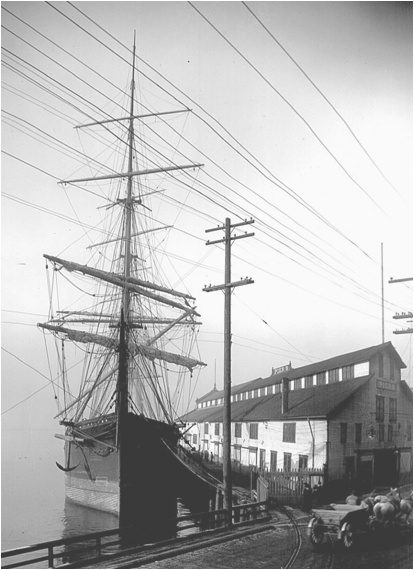 While at anchor in ballast at Tacoma, Puget Sound, WA, the chains to the ballast logs broke at a sudden squall during the night and ship capsized and sank. The master and the crew were all killed when the ship went down. The British bark Andelina, 2,345 tons, of Nova Scotia, Capt.G.W.Stailing, sank in 22 fathoms of water in front of the St.Paul Mill wharf, and the Captain, the mate, and fifteen of the crew were drowned. The accident occurred during the night. The vessel came four days ago in ballast from Shanghai. The ballast had been discharged, and the ship was lying at anchor waiting to be towed into the dock. Last night a terrific gale raged out in the bay, the wind blowing thirty-six miles an hour. Two great boom logs were placed beside the Andelina, one on each side. During the gale between 2 and 4 this morning one of the logs went adrift, causing the ship to careen and to capsize with very little warning to the crew. 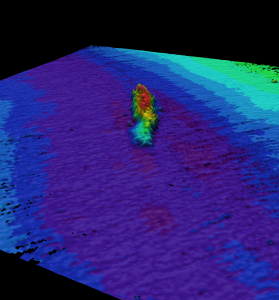 The vessel was entirely without ballast and the hatches were open. All on board were caught like rats in a trap and had no chance of escape. 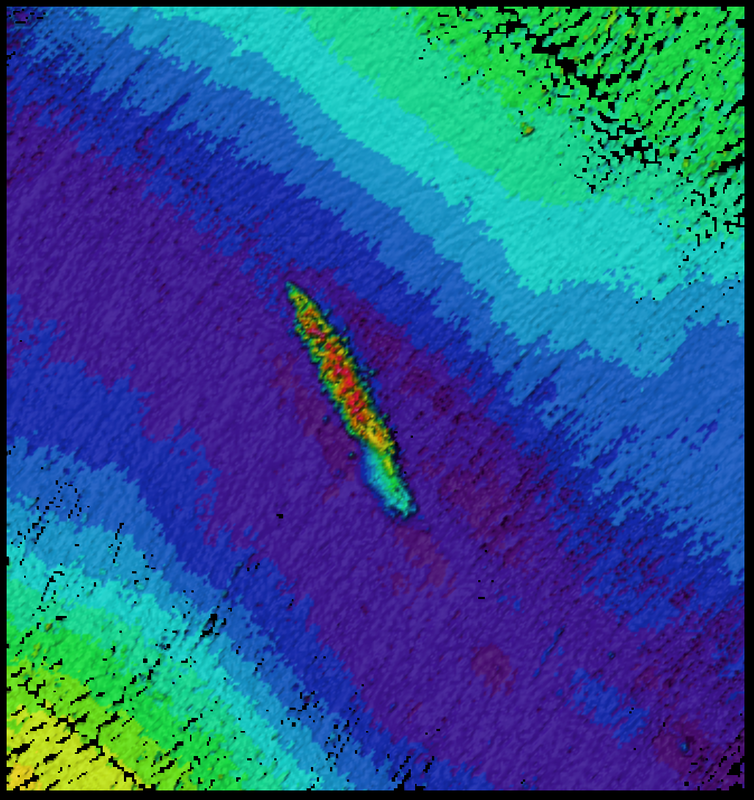 The ship simply careened over, the water flowed in the open hatches, and she sank. At daylight this morning the ship was missed. Where she had been riding, apparently securely at dusk the night before, there showed but a blank stretch of water. The wreckage which was strewn about the bay told the vessel’s fate. A large number of the crew were discharged yesterday, or the loss of life would have been far more appalling. The ship was to commence taking on a cargo of wheat for Queenstown today, and was to receive further orders. Capt.Stailing lived in Anapolis, N.S., and leaves a widow and three children. He is well known in this port. 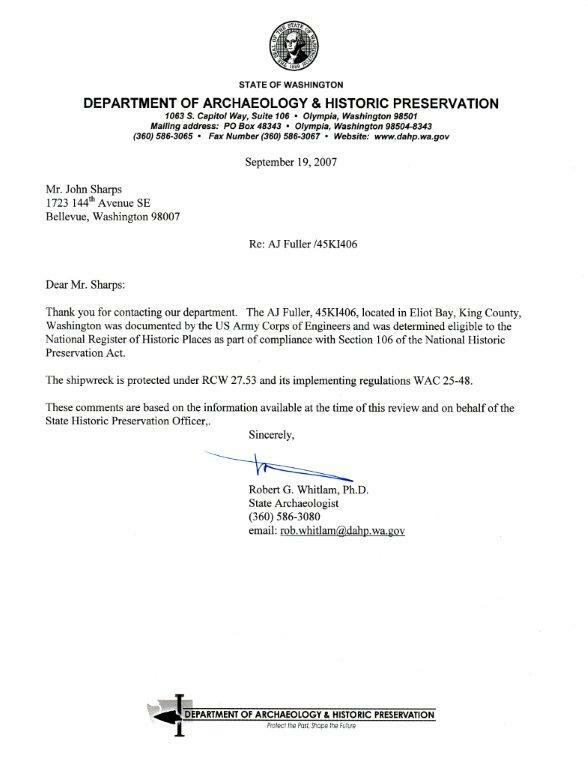 On January 14  a tragic accident had occured in the harbor of Tacoma. In contrast to the freightening uproar attending the Kingston-Glenogle collision, this disaster took place without warning and in almost complete silence. 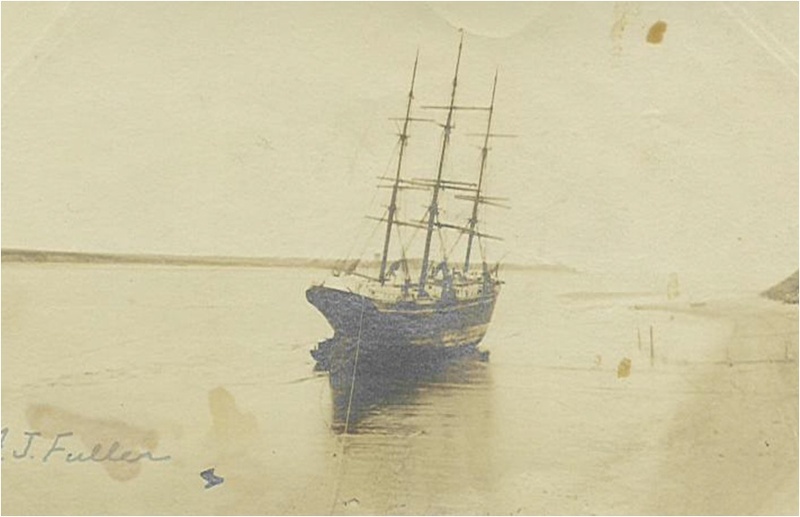 The four-masted, full rigged British ship Andelana was laying at anchor preparatory to taking on cargo. 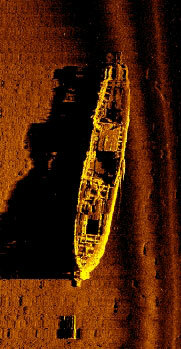 Her ballast had been removed and she was held upright by logs chained to her hull on either side at the waterline. During the night Commencement Bay was swept by winds of nearly forty miles an hour and as a gust hit the towering tophamper of the 2,579-ton ship she capsized and sank in 180 fathoms of water, carrying Capt. 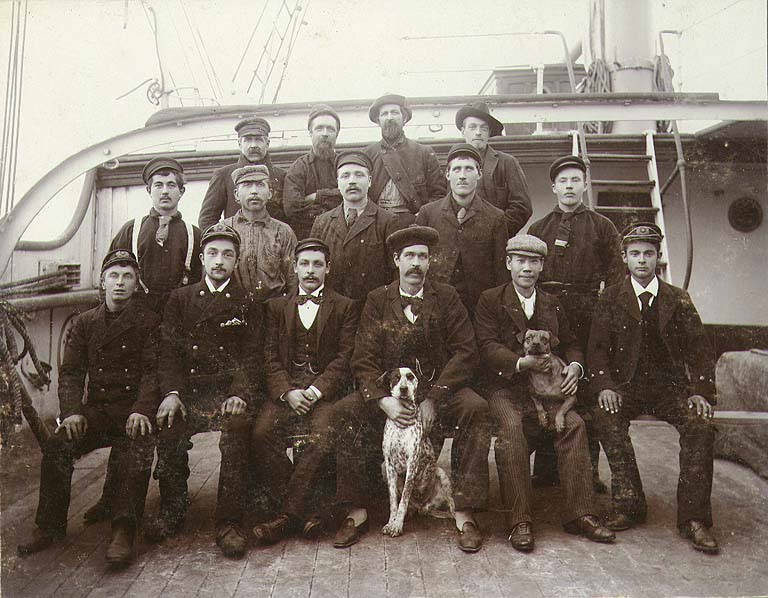 George W. Stalling and all hands to their death, the only survivor of the Andelana’s crew being an apprentice, Percy B. Buck, who was ill at a Tacoma hospital. 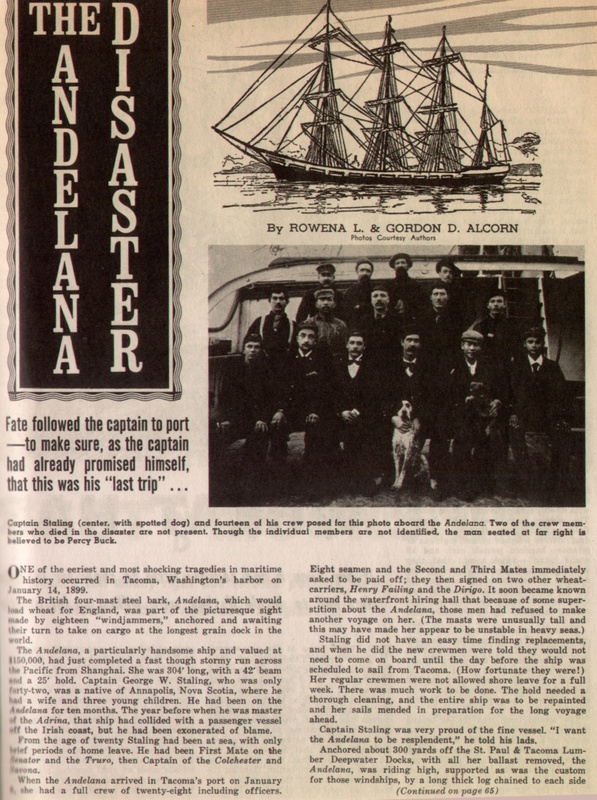 The Andelana was a British bark that vanished during a Jan. 6, 1899, windstorm while moored in Tacoma’s Commencement Bay. [The four-masted British bark had been moored there, roughly 500 yards from shore. The crew had unloaded its cargo of steel and was bunked down for the night. The plan was to load up with wheat in a day or two and set sail for San Francisco. Without ballast, the 300-foot ship was kept on even keel by chains fastened to heavy logs on either side. Then, during the night a windstorm hit and the ship vanished, slipping silently below the waterline and entombing all 17 sailors aboard. It had not been rammed or burned; no one saw or heard it go down. It appeared that the rigging broke during the storm, tipping and capsizing the Andelana. 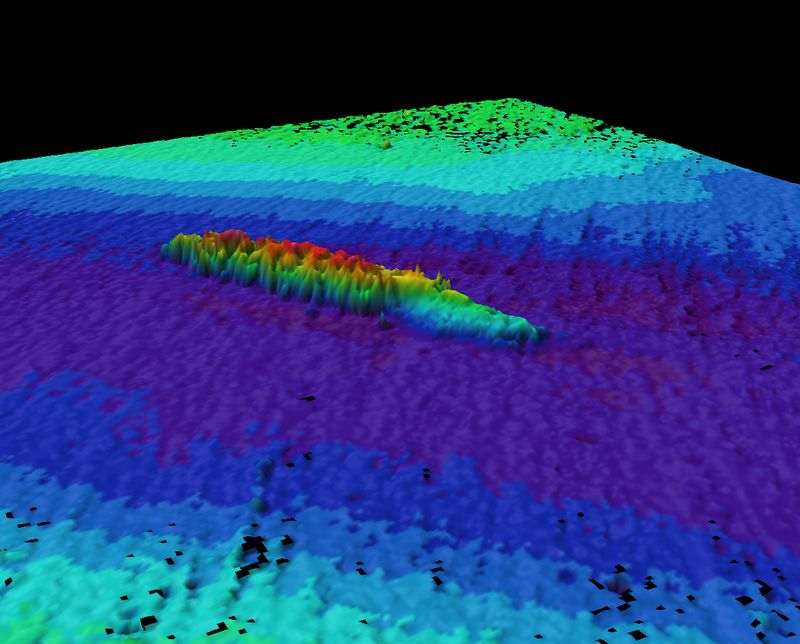 It has apparently been found from time to time – In 1935, a diver looking for a tugboat’s anchor stumbled upon the silt-covered hulk of the Andelana. In 1954, some of the ship’s ironwood railing was hauled up and made into gavels for Republican clubs around the state – but the wreck has never been explored by divers. 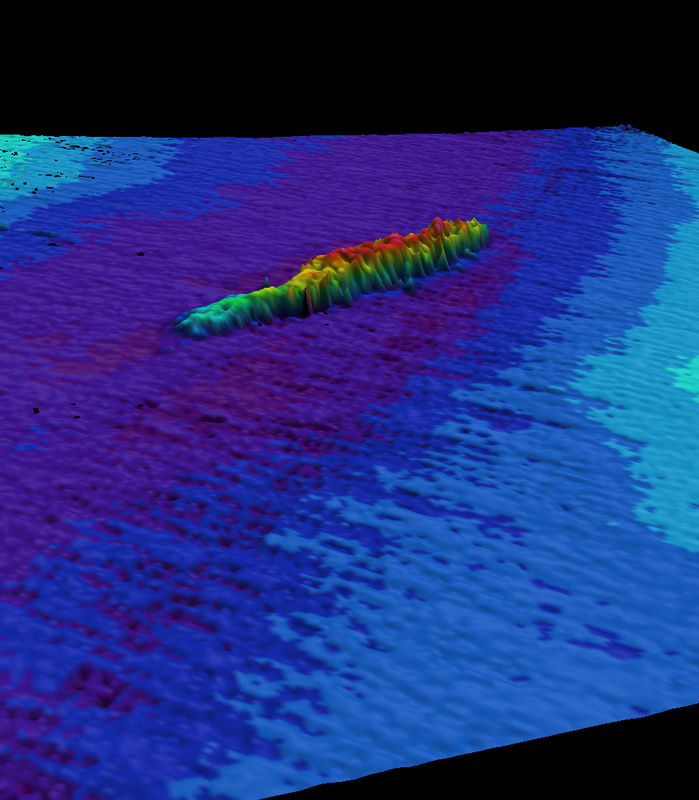 I believe the Commencement Bay bathymetry points to its location. 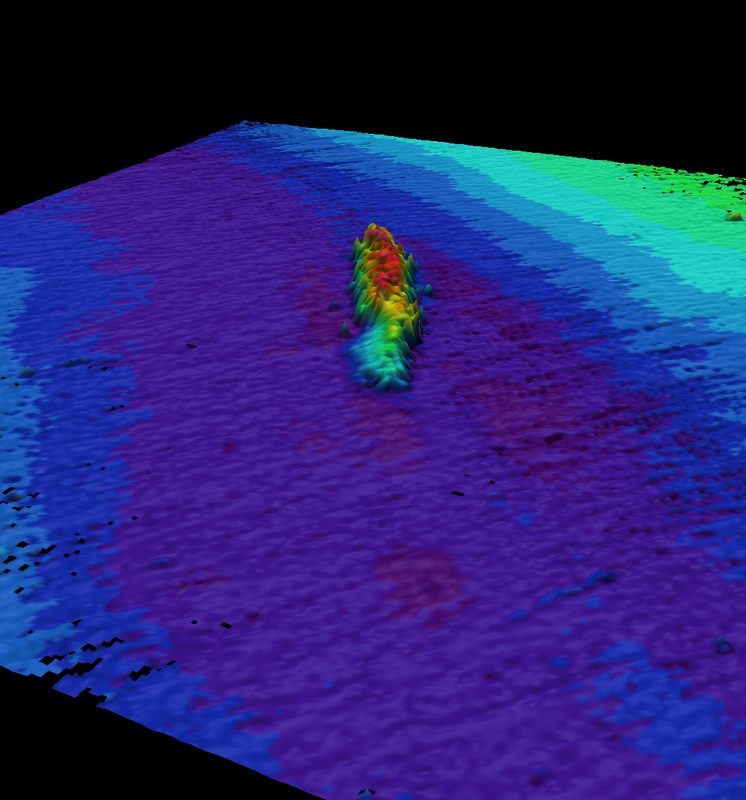 In the bathymetry included here the wreck is marked as ‘Target with Shadow’ and lies between 60 and 80m; which would give the depth of the wreck as approx 230ft. 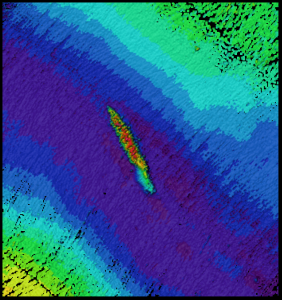 – Other unknwn wreck highlighted.